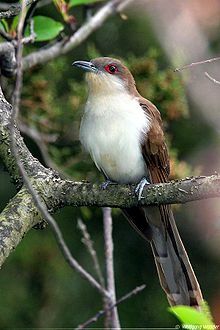 The black-billed cuckoo (Coccyzus erythropthalmus) is a New World species in the Cuculidae (cuckoo) family. The scientific name is from Ancient Greek. The genus name kokkuzo, means to call like a common cuckoo, and erythropthalmus is from eruthros, "red" and ophthalmos, "eye". It is very similar and overlaps in range with the closely related yellow-billed cuckoo. A distinguishing characteristic of family Cuculidae is laying eggs in the nests of other birds. Although many cuckoos are obligate brood parasites, C. erythropthalmus often incubate their own chicks. This juvenile black-billed cuckoo was banded at McGill Bird Observatory (MBO) in June 2015. Breeding, migrating and wintering ranges of the black-billed cuckoo. Adult black-billed cuckoo hiding in some branches. ^ BirdLife International (2012). "Coccyzus erythropthalmus". IUCN Red List of Threatened Species. Version 2013.2. International Union for Conservation of Nature. Retrieved 26 November 2013. ^ Jobling, James A (2010). The Helm Dictionary of Scientific Bird Names. London: Christopher Helm. pp. 112, 150. ISBN 978-1-4081-2501-4. ^ a b Sealy SG. (2003). Laying times and a case of conspecific nest parasitism in the Black-billed Cuckoo. Journal of Field Ornithology. 74(3): 257-260. ^ Godfrey, W. Earl (1966). The Birds of Canada. Ottawa: National Museum of Canada. p. 210. ^ Sibley, David Allen (2000). The Sibley Guide to Birds. New York: Knopf. p. 268. ISBN 0-679-45122-6. ^ a b c d Hughes JM. [Internet]. (2001). Black-billed Cuckoo (Coccyzus erythropthalmus). Ithaca, NY: Cornell Lab of Ornithology; [cited 2015 Oct 6]. Available from: http://bna.birds.cornell.edu/bna/species/587/articles/introduction. ^ Peterson RT. (2008). Peterson Field Guide to Birds of North America. 1st ed. New York, NY: Houghton Mifflin Company. 531 p.
^ Nolan V. (2002). External Differences between Newly Hatched Cuckoos (Coccyzus americanus and C. erythropthalmus). The Condor. 77(3):341. ^ Van Velzen WT. (1967). Black-billed Cuckoo Records in California. The Condor. 69(3):318. ^ Paulson, Dennis (2013). "Cuckoos - Tent Caterpillar Birds". birdnote.org. BirdNote. ^ "Tennessee's Watchable Wildlife: Black-billed Cuckoo". tnwatchablewildlife.org. Tennessee Wildlife Resources Agency. Retrieved 4 October 2015. ^ Barber NA, Marquis RJ, Tori WP. (2008). Invasive prey impacts the abundance and distribution of native predators. Ecology. 89(10): 2678-2683. ^ Koenig WD, Liebhold AM. (2005). Effects of periodical cicada emergences on abundance and synchrony of avian populations. Ecology. 86(7):1873–1882. ^ Sealy SG. (1985). Erect Posture of the Young Black-Billed Cuckoo: An Adaptation for Early Mobility in a Nomadic Species. The Auk. 102(4):889-892. ^ Sealy SG. 1978. Possible Influence of Food on Egg-Laying and Clutch Size in the Black-Billed Cuckoo. The Condor. 80(1): 103-104. ^ Guigueno MF, Sealy SG. (2011). How small is too small? Incubation of large eggs by a small host. Canadian Journal of Zoology. 89(10):968-975. ^ Hughes JM. (2000). Monophyly and phylogeny of cuckoos (Aves, Cuculidae) inferred from osteological characters. Zoological Journal of Linnaean Society. 130(2): 263-307. ^ Hughes JM. (2006). Phylogeny of the cuckoo genus Coccyzus (Aves: Cuculidae): a test of monophyly. Systematics and Biodiversity. 4(4): 483-488. "Black-billed cuckoo media". Internet Bird Collection. Audio recordings of Black-billed cuckoo on Xeno-canto.